This recipe from Super Natural Cooking: Five Ways To Incorporate Whole and Natural Ingredients into Your Cooking sounded pretty interesting — it’s not your Garden(burger) variety veggie patty. With this recipe, the veggie patty is the bun, so you don’t end up with such a dry burger. You can then fill it with whatever strikes your fancy: we used avocado, sauteed shrooms, tomato, and sprouts. Ha, these are awesome! It’s like an inside-out burger. I know — not only do they taste delicious, they look pretty fancy. We should make them for our next party. I could totally see that — have a tray filled with these guys already assembled. Yum. That holds true with most things, IMHO. Did you bring that up just because I burned that one batch? Hmmmm… now why would I do that? Just saying they’d probably be so delicious on these mini-burgers… mmmm, so goood….! O burnt shallots! Why must ye torment me so, cruel devils!? Not sure. I just really want those on my burger now. Combine the garbanzos, eggs, and salt in a food processor. Puree until the mixture is the consistency of a thick, slightly chunky hummous. Pour into a mixing bowl and stir in the cilantro, onion, zest, and sprouts. Add the breadcrumbs, stir, and let sit for a couple of minutes so the crumbs can absorb some of the moisture. Form into twelve 1 1/2″-thick patties. (Remember, these are mini-burgers, so they’re not very wide). If the batter seems too moist to form into patties, add more bread crumbs a bit at a time to firm it up. Or, if too dry, add a bit of water to moisten the batter. Heat the oil in a heavy skillet over medium low, add 4 patties, cover, and cook for 7 to 10 minutes, until the bottoms begin to brown. Raise the heat if after 10 minutes there is no browning. Flip the patties and cook the second side for 7 minutes, or until golden. Remove from the skillet and cool on a wire rack while you cook the remaining patties. Cut each patty in half — like a bun! — fill with your favorite treats, and eat! Update: As suggested by one commenter, I’m submitting these little guys to Equal Opportunity Kitchen’s Tried, Tested and True 3: Wedding Edition . This entry was posted on Tuesday, February 10th, 2009 at 6:53 pm	and is filed under Appetizers, Main Dishes, Super Natural Cooking, Vegetarian. You can follow any responses to this entry through the RSS 2.0 feed. You can leave a response, or trackback from your own site. This is very interesting. 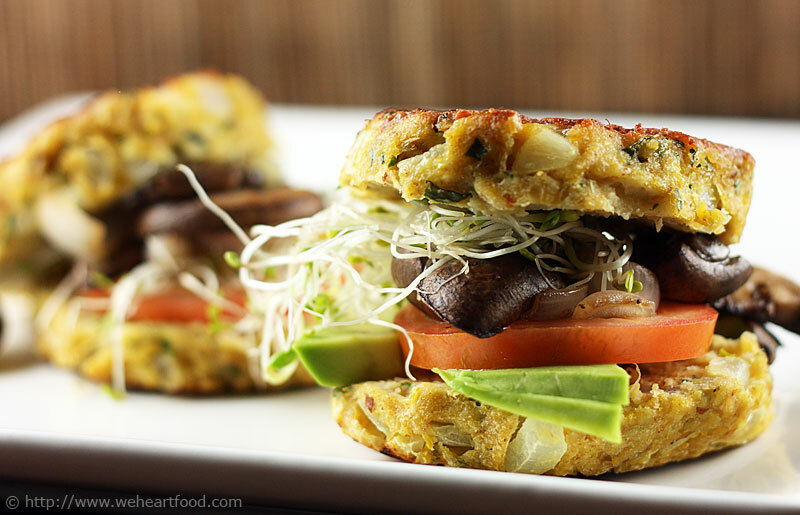 I was watching top chef the other day and one of them made a veggie burger like this! What a great idea! I always take the bun off my veggie burgers anyway – I like the flavor and all that bread just mutes it. I’ll try this! Yum! But why oh why do they have to be mini? Why not Veggie Mega-Burgers? Down with the tiny food; bring on the giant food!! Too cool. I love the idea of a bun made out of vegetables. Now I’m tempted to get that cookbook. Thanks very much for participating in TTT3!